It's finally my turn for the Make-the-Cut Blog Hop. If you've gotten lost, just click the blog hop button on the right to find the main page with the list of all the participating blogs. Also be sure to read to the end of this post for the blog candy info! As many know, MTC does not work with the cricut anymore. But fear not! It works with plenty of other cutters, including the Black Cat Cougar, Black Cat Lynx, Bosskut Gazelle, Silhouette, Craft Robo, US cutter MH/Laser point series, ECraft, Pazzle, KNK, and any cutter using an HPGL printing support feature. So on to my projects. I have the Silhouette SD and although it's not yet a native plotter in Make-the-Cut, it is possible to cut with it through the print menu. It works perfectly and I wanted to focus on using both a graphic and an svg file. 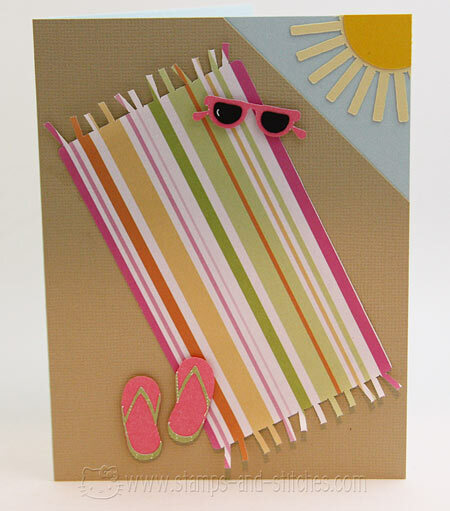 My first project is this summer card. I made it for my daughter to give her speech therapist since she only goes to speech therapy during the regular public school year. So it'll be a nice 'Have a Great Summer' type card. I used the pixel trace function in MTC to trace some images from the Sunshine Fun graphic set. I had to trace some of the images more than once, but usually only twice, to get all of the shapes I needed. (For tutorials see the end of this post-I will post links to them.) Patterned papers are from KI Memories and Stampin' Up. Cardstock from Bazzill and Stampin' Up. For my next project I wanted to use an svg set. 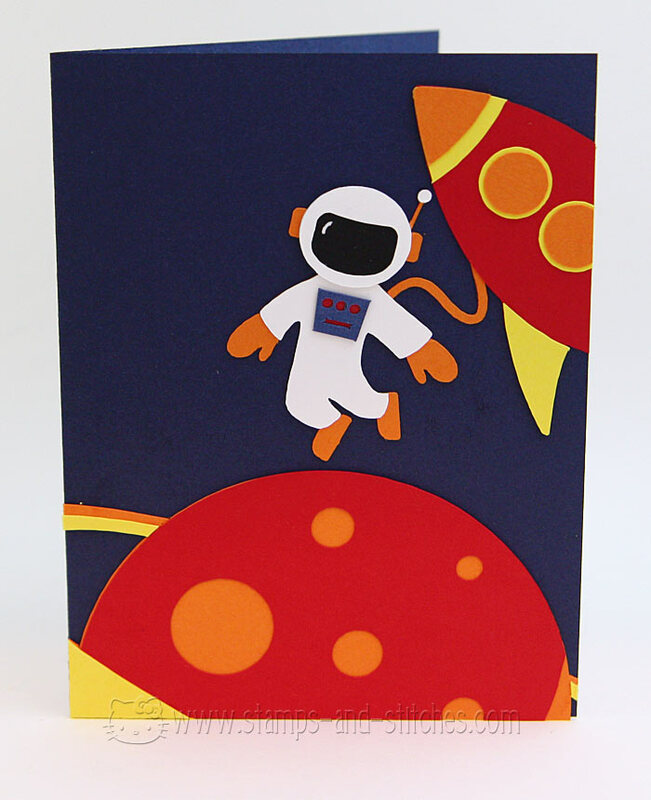 So I imported some shapes from the Doug's Outer Space svg set and cut them out for this cute boyish spaceman card. Using svg files in MTC is so easy and I love that Lettering Delights has so many to choose from. Cardstock is all from Bazzill, Neenah and Stampin' Up. I also wanted to mention that despite popular belief, the Silhouette SD does cut heavier cardstock without any problems whatsoever. I used Stampin' Up, Bazzill and Neenah paper on both of my projects and did not do any multi-cuts. All of the cuts came out perfect and clean, even in the corners and on the smallest shapes. Both cards here are 4.25 x 5.5 so you can just imagine how tiny some of these cutouts are! And now for the blog candy. I'm offering a $10 gift certificate to Lettering Delights!! To enter, just leave a comment-that's it! If you want to follow my blog I'd be grateful but it's not necessary to be eligible for the gc. I will draw a name a week after the hop ends. And be sure to check the main hop page every day to see whose blog to visit next! !